For all the horrors that Democrats saw in the fallout from the 2016 Election, 2017 and 2018 have offered plenty of reasons for optimism. With a new crop of candidates, tons of energy around organizing, and some shocking recent victories in Special Elections, even Texas Democrats are hoping for some serious magic in this November’s Elections. But can they make magic, without money?? AUSTIN — Houston businessman Andrew White, working to break out of a crowded Democratic primary race for governor, said Monday he has made a $1 million loan to his campaign for the effort. “I’m going to raise as much as I possibly can, and I’m going to spend it all,” White said, estimating the primary race will take several million dollars. He previously said he made a $40,000 loan to his campaign. 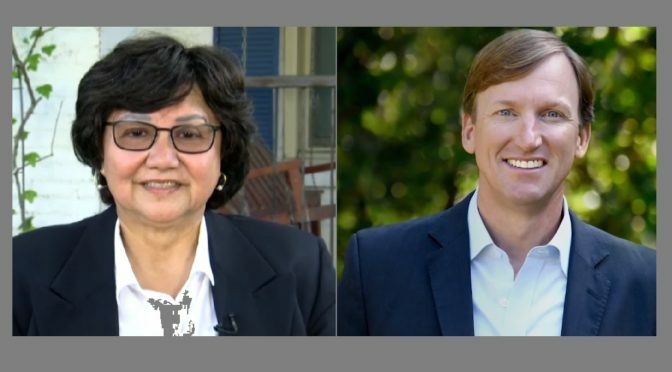 White and former Dallas County Sheriff Lupe Valdez have received the bulk of the attention in a nine-way race for the Democratic nomination to challenge Republican Gov. Greg Abbott, who has more than $43 million in his campaign account. Valdez — who according to her campaign raised $48,504 in the first part of this year, including a $5,000 loan she made to herself — said in a statement that she isn’t concerned about White’s money. “I came from humble beginnings as one of eight children born to migrant farm workers. I then spent my career in service to the people of Texas. I’m not wealthy, but I have a lot to be thankful for — including the grassroots support that’s powering my campaign and this movement. I’m not worried about Andrew White’s million-dollar campaign loan, because Texan Democrats can’t be bought, and we’ll prove that on election day,” she said. Andrew White formally announced his campaign on December 7th, one full month ahead of Lupe Valdez‘s campaign kick-off. However, it’s also worth noting that Valdez is a current elected official, while this is White’s first run at office. So yes, it’s only been a total of two months since these folks hit the trail. And yes, it is the Primary election, where many campaigns would prefer to save any potential resources for the General Election. But whatever one’s situation, if these candidates are to be taken seriously in the race Texas Governor, the campaign contributions are going to have to improve rapidly. A credible challenger to juggernaut Greg Abbott should be starting their campaign with a six and seven figure war chest, because that’s what they will need to build some serious name ID across the state. As a high profile elected official in the Dallas area, Sheriff Valdez is clearly up on the name ID front. But how is she going to reach voters in Midland, Mexia or Marfa on a $50,000 budget?? Mr. White has been gaining ground in recent weeks, and even racked up some impressive endorsements. With the press alone that his $1 million dollar self donation has generated, he’s proving that he can emerge from a crowded field. But the lack of diverse, small dollar donations is troublesome, and does not invite confidence in others to sign on to his effort. So the game right now for Democrats really comes down to one thing above all… attention. How can a Democrat get their name and face out to 28 million citizens? Gubernatorial candidates would do well to take some cues from Senate hopeful Beto O’Rourke, who has managed to combine an aggressive social media apparatus with a bold, 254 county shoe leather campaign. Whether he wins or loses, at Texans I’ll know that he is a viable choice for the job. Both Valdez and White have met several times in various candidate forums. Perhaps they, and other Primary candidates would consider holding a couple of live-stream debates before the Primary election? Though most Texans aren’t yet paying attention, it could be a great way to further engage those that are ready to put their money to use. However they choose to make those money moves, the time is NOW.